Need an easy way to keep track of your domain names and SSL certificates? Expirify is the perfect SSL checker and expiry date reminder tool. Store your domain information all in one place. 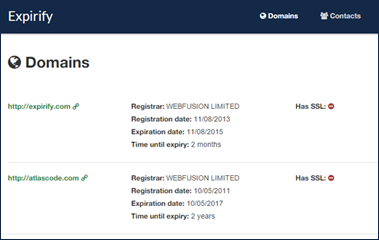 If you have domains registered with multiple registrars it can be a bit of a nuisance to keep track of everything. 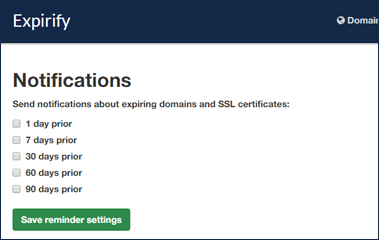 Expirify lets you see all of your domains in one list and tells you where and when they were registered, the domain expiration date, whether or not you have an SSL certificate and when the SSL certificate will expire. Decide when you want to be reminded. How far in advance would you like to be reminded that your domains and certificates are going to expire? A month? A week? A day? The choice is yours. 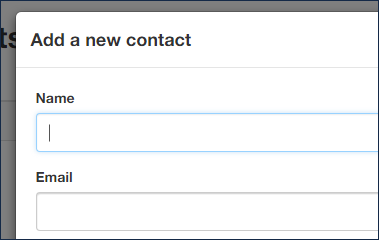 Choose who you want to receive reminder emails. One of the benefits of Expirify is that for each of your domains you can decide who should be reminded about upcoming expiry dates, whether that’s just you, your clients, or your whole team. Take advantage of our API. 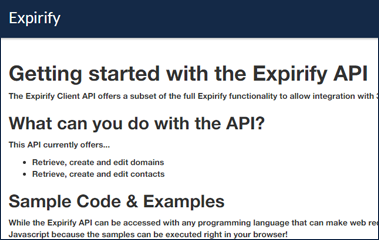 Expirify offers a restful web API which provides methods for managing your domains and contacts. This allows you to integrate Expirify with your existing systems. You can find our full API documentation here.